To Beth on the "Ships starting with B" page. Tonnage: 6852 gt, 10 475 tdwt. Call Sign: LDPH, new BMCR. Built by William Doxford & Sons Ltd., Sunderland in 1930. May 23 Bermuda   BHX 45 For Le Havre. Aug. 5 Milford Haven   OB 194 Dispersed in 54 36N 18 02W Aug. 10. Aug. 24 Londonderry   OS 4 Detached to Curacao Sept. 4. Oct. 20 Liverpool   ON 28 For Trinidad. Dispersed in 42 23N 58 44W Nov. 3. Dec. 28 Londonderry   ON 51 For Trinidad. March 10 Reykjavik   ON 74 Again, see also Page 2. Joined from Iceland March 14. As will be seen when going to Page 1 of the archive documents, Beth was on her way from Curacao to Dakar when war broke out in Norway on Apr. 9-1940. With fuel oil for Brest (for orders), she's listed among the ships in the Bermuda portion of the Halifax-U.K. Convoy HX 45 in May, and arrived Brest on June 7. A. Hague indicates she may have taken part in Operation Aerial later that month (the evacuation from France) - see the link provided in the Voyage Record above. It'll be noticed, when going back to the archive document, that she later had quite a long stay in Cardiff. 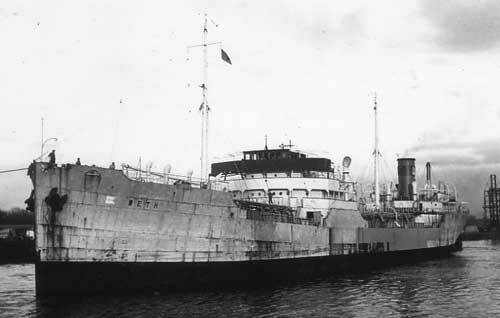 Together with Balla, Fernbrook, Granli and Madrono, she subsequently joined Convoy OB 194, which originated in Liverpool on Aug. 6 and dispersed on the 10th, Beth arriving Capetown independently on Sept. 4 (again, ref. link in the table above). The archive document also shows a long stay in Capetown at the end of that year. Her 1941 voyages also start on Page 1. As can be seen, she spent a long time in New York, where she had arrived from Curacao on May 28-1941*. Departure is given as July 11, when she proceeded to Halifax, with arrival July 14. On July 22, she was scheduled to sail to the U.K. with Convoy HX 140, but developed engine problems and had to leave the convoy and return to Halifax, subsequently joining HX 141 on July 27. She arrived Londonderry on Aug. 10, remaining there for 2 weeks. Her voyages in this period are shown on Page 2. * She appears to have lost a crew member in this period. According to the book "Våre falne", which lists Norwegians who died during the war, Radio Operator Olav J. Aga died in an accident on board on June 17-1941 and is buried in Brooklyn. See the link to Stavern Memorial at the end of this page. She can now be found in Convoy OS 4, which originated in Liverpool on Aug. 23 (Segundo was sunk, follow link for details - see also the external link further down on this page). The external website that I've linked to in the table above has two different sections showing Convoy OS 4. Beth is included in one of them (based on A. Hague's database), but not the other, where the listing is incomplete. The only Norwegian ships named in the latter section are Ingria and Segundo, while A. Hague has added the Norwegian Chr. Knudsen and Elg as well. OS 4 was a Freetown bound convoy, but Beth was detached for Curacao on Sept. 4, arriving there on Sept. 12, continuing to Halifax the next day (Page 2) in order to join Convoy HX 152 back to the U.K. on Sept. 28, along with Drammensfjord (station 106), Høegh Giant (92), Evita (93 - returned), Trondheim (95), Salamis (84) and Storanger (83). Beth arrived Liverpool on Oct. 14, and a few days later she took station 22 of the westbound North Atlantic Convoy ON 28*, which left Liverpool on Oct. 20 and dispersed Nov. 3, Beth arriving Trinidad independently on Nov. 11. Other Norwegian ships in this convoy were Brant County, Grena, Laurits Swenson, Morgenen, Polartank and Ringstad. Together with the Norwegian Astrell, Brant County, Katy, Sama, Skandinavia, Bello and Høegh Scout (Norvinn, Panamanian flag, Norwegian managers and, therefore, included on this site, was also scheduled for this convoy but did not sail), Beth intended to head back to the U.K. in Convoy HX 162 from Halifax on Nov. 27. However, she returned to Halifax, later joining HX 163 on Dec. 3, arriving Londonderry Dec. 19/20, according to Page 2. About a week later, she joined the westbound Convoy ON 51*, and was again in the company of other Norwegian ships, namely Carrier (returned), Far, Fjordheim, Ingerfire and Sirehei. Beth arrived Trinidad independently on Jan. 21-1942, the convoy having dispersed on the 11th. In Febr.-1942 we find her in Convoy HX 174, together with the Norwegian James Hawson (returned), Athos, Fernwood, Vanja, Thorsholm, Høegh Giant and Anderson (lost, follow the link for details), as well as the Panamanian Norvinn (collided, returned). Acanthus and Rose were among the escorts for a while. This convoy left Halifax on Febr. 7 and arrived Liverpool on the 21st, but Beth was bound for Iceland where she arrived on Febr. 19, later joining the westbound Convoy ON 74* from there on March 14, taking station 112. ON 74 had originated in Liverpool on March 9 and also included Arosa, Borgfred, Elg, Sirehei, Thorsholm, Titanian, Tortugas and Tungsha. Beth was again bound for Trinidad, and detached from the convoy in order to proceed to her destination, arriving March 31. From Trinidad, she subsequently made an independent voyage to Freetown, arriving Apr. 20 (Page 2). * The ON convoys will be added to individual pages in my Convoys section, with more information on each; in the meantime, the ships sailing in them (and escorts) are named in the section listing ships in all ON convoys. Beth (in Admiralty service) had arrived Port of Spain from Freetown on May 8-1942 (Page 2), having sailed from Freetown on Apr. 26 in convoy SL 108 (available via the external link provided in the table above; Maloja and San Andres are also listed - according to A. Hague, Beth had detached from the convoy on Apr. 28). By May 10, she had loaded a cargo of 10 109 tons of Admiralty fuel at Ponte Pierre, but could not depart for Freetown until the 16th because of a faulty dynamo that needed to be repaired. The day after departure, in the morning of May 17, they spotted a drifting raft in the oil covered sea and realized a tanker had been sunk in the area (M/T San Victorio?). At 20:20 ship's time, when about 135 miles east/southeast of Barbados, she was struck in the starboard side near No. 1 tank by a torpedo from U-162 (Wattenberg), resulting in a tremendous explosion with oil all over the ship. Both aft boats were launched as was the motorboat, the latter with the 1st mate, the steward, the radio operator and the captain. 3 men had ended up in the water; the 3rd mate was picked up by the starboard boat and the other 2 by the port boat commanded by the 2nd mate. Having heard cries from someone in the water they rowed around and found Able Seaman Jens Adolfsen, too exhausted to help himself, so Able Seaman Gundersen went in the water and got him into the boat. About 20 minutes after the 1st torpedo had hit, when the boats were clear of the ship, a 2nd torpedo hit behind midships near tank No. 5, the explosion sending flames sky high, and about 5 minutes later the ship sank. After Beth had gone down the U-boat came up near the captain's boat to ask the usual questions about ship and cargo etc., and also offered help (this was refused). A report presented at the maritime hearings states that a green flare was seen from another U-boat nearby, whereupn U-162 left them, heading in a southerly direction while starting to submerge. The boats had become separated in the dark, but shortly afterwards the captain's boat and the port lifeboat with 17 men were reunited. The 3rd boat could not be found. They remained in the area until daylight, then set a course for Barbados, landing at Conset Bay 36 hours later. They requested that the authorities send out an aircraft to look for the others, and 3 days later they were told that the 9 in the 3rd boat had landed at Tobago in the evening of May 20, and that they had been sent to Port of Spain the next day. The maritime hearings were held in New York on July 8-1942 with Captain Gulliksen, one of the mates, Able Seaman Jens Adolfsen (lookout), Able Seaman Henry M. Brekke (helmsman), and Radio Operator Karl Lorang-Olsen appearing. The latter had sent out SOS after the 1st torpedo hit. None of the survivors could say how Boatswain Svendsen had perished. He had helped launch the port boat and it was suggested that he may have been crushed between the boat and the side of the ship, the tackles and everything else being slippery with oil. Beth is listed as British in Jürgen Rohwer's book. He says she sank in 11 48N 57 32W at 02:10 on the 18th, German time. Charles Hocking simply gives the position as 135 miles east/southeast of Barbados (agreeing with the official report), while "Nortraships flåte" gives the position as 13N 57W. For info, U-162 was also responsible for the attacks on Frank Seamans and Thelma that same year - follow the links for details. The U-boat was sunk just a few months after Beth was lost - ref. link at the end of this page. According to Lillesand Sjømannsforening (external page), Gunleiv Gundersen had previously served on Spero and Fana. After the loss of Beth, he joined Bronxville (also sunk), then Thorsholm, Kirkenes and Montevideo. Lars Birkeland had previously survived the loss of Pericles. Also survived the sinking of Vestfold. Later served on Fagerfjell and Royal. * Boatswain Svendsen's son Sverre Einar Svendsen died when the Swedish Korshamn (ex Norwegian Vigo) was sunk in March-1941. See Convoy HX 112. According to the Stavern Memorial, 12 Norwegians perished with this ship - link below. Stavern Memorial commemorations - The memorial for seamen in Stavern says 2 men died while trying to get the boats on the water. Radio Operator Olav Johnsen Aga and Boatswain Sigurd Bernhard Svendsen are commemorated. According to the book "Våre falne", which lists Norwegian WW II casualties, Olav J. Aga died in an accident on board on June 17-1941 and is buried in Brooklyn. From Page 1 of the archive documents, we learn that Beth was indeed in New York on that date. The Stavern Memorial also has a listing of the Norwegians who died on Korshamn. Back to Beth on the "Ships starting with B" page. The text on this page was compiled with the help of: "Nortraships flåte", J. R. Hegland, "Sjøforklaringer fra 2. verdenskrig", Volume I (Norwegian Maritime Museum), and misc. others for cross checking info., named in the narrative - ref My sources.